For over 10 years, consumers have been searching for environmentally-friendly products that protect wildlife and human well-being. The business and construction markets are responding to the consumer demands for quality products and buildings. You are able to realize financial rewards when you are involved in Green Asset spending. I am offering two Free teleseminars: 1 Business Trends and Consumer Spending and 2 Construction and Remodeling for Energy Efficiency. The teleseminars will be the Launch of an in depth education program to serve consumers with their effective spending decisions. These programs will ease the pressure of choosing products that do not harm the environment and your health. The Live, Free Teleseminar series will be held on Tuesday, December 2, at 2:00 pm Central Time and Thursday, December 4, at 2:00 pm Central Time. A live Facebook comment window offers an opportunity for networking. Mark your calendar and I will be posting more information Please share this event with others. The Shelton Group (2014, EcoPulse) states “70% of Americans say they’re searching for greener products”. Certification labeling is becoming big business to help the consumer with their conscious spending choices. Yet, greenwashing and misleading labeling tends to confuse the consumer. If you are in a retail business and do not have green products in your inventory then you are only targeting 30% of the consumers. GreenAmerica.org posted some very interesting statistics that indicate the green construction industry is booming as over-all construction is declining. Consumer spending has significantly spiked the organic food and non-food industries in stark comparison to non-organic product growth. The number of people choosing green oriented Masters in Business Administration (MBA) programs have risen by 300% from 2006 to 2011. There are Eco-Kids programs popping up all over the place and Moms Clear Air Force is worth googling. I was curious to see what type of a response would result from a quick survey. The picture you see above was posted on Facebook, Pinterest, and Twitter with the words “What do you think of when you see the words Going Green?”. I added a comment about “Please post a comment and Share for more responses”. Three Likes and no comments ensued. As the memories of over 400,000 people marching for the awareness of Climate Change are still alive, I was hoping for a little bit more excitement over my fluorescing Green Tiger. 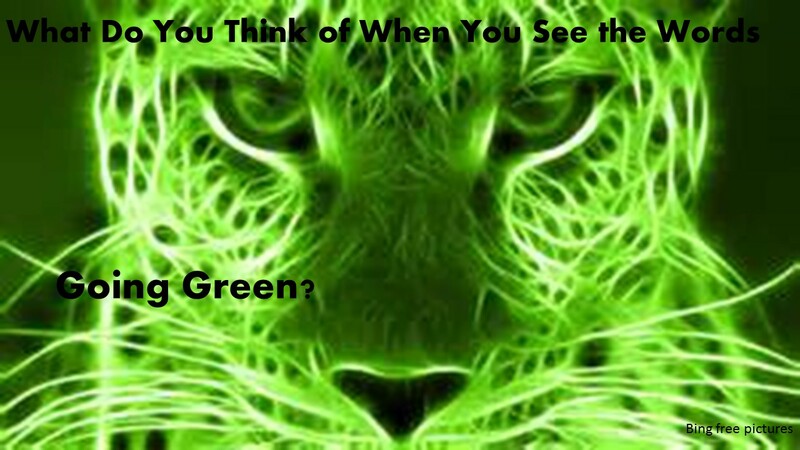 Perhaps people are thinking green yet unable to put their thoughts into words. Eco-literacy is a skill that helps people to work with clients, patrons and to acquire jobs. The third and final video on Business satisfaction may be found at http://youtu.be/hf89ObZQvTA. Thank you in advance for any comments to let me know what you think about the information or my brave dive into another of the diversity of social media platforms. My passion is strong to motivate the masses to Go Green and protect the environment and wildlife. I am comforted by Donald Trump’s words: “Without Passion you don’t have Energy. Without Energy you have Nothing”. Tap into your Passion to Drive your Energy towards Great Rewards with Patience. Previous PostCARBON DIOXIDE FOUND INDOORS IMPACTS YOUR HEALTHNext PostARE YOU READY TO PARTY GREEN?